Catheters are flexible, hollow tubes with two lumens. Blood leaves the patient’s body passing through one lumen, enters the dialysis circuit, and is returned to the body via the other lumen.Two types of venous catheters are available, tunnelledand non-tunnelled. 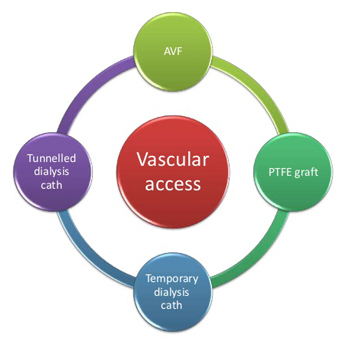 The arteriovenous or AV fistula is the most common and the best method of vascular access for long term hemodialysis. Want to know more about Kidney Diseases? KidneCare Institute of Kidney Disease and Transplantation is one of India's largest super specialty institutes located in Karnal. Founded by eminent Nephrologist Dr Dinesh Dhanda, the institution has been envisioned with the aim of bringing to India the highest standards of medical care along with clinical research Read More..
© 2016 KidneCare. All Rights Reserved.